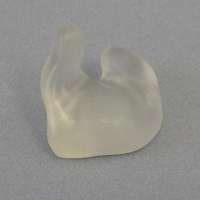 Hard Clear A crystal clear hypoallergenic material that is resistant to breakage. This is our most popular hard material. Light pink or brown tint, tint in the six primary colours of the rainbow, and silver or gold sparkles are available on request. Satin finish is also available. Ultraflex This hypoallergenic, ultra smooth, temperature sensitive acrylic compound is used where a soft material other than PVC or silicone is preferred. It is the softest acrylic product in our line. 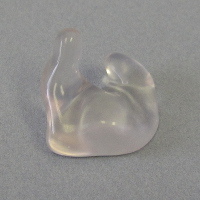 Translucent clear satin finish, easy to insert. Also available in pink tint and light or medium brown tint. Softex Ideal for geriatric use, this semi rigid Acrylic material softens with body heat, yet still retains its memory and never loses shape. 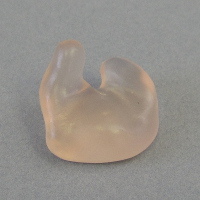 Satin translucent clear is almost invisible, and in addition we also offer pink tint, and light and medium brown tint. 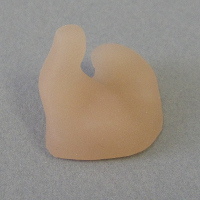 Mediflex Where some flexibility is still desired, this hypoallergenic medical grade material is ideal. It softens with body temperature similar to Softex, and is an opaque flesh colour. Medicryl A rigid hypoallergenic medical grade acrylic formula, which is substantially inert. 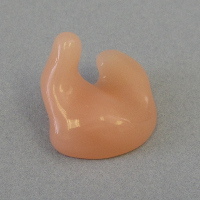 This is a very popular material, similar to that used for custom in-the-ear aids and is available in high shine or satin opaque flesh colour. Hard/Flex A combination acrylic concha with your choice of any of the soft acrylic or PVC materials for the canal. 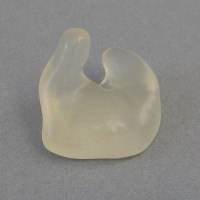 We will normally make the concha out of Hard Clear and the canal out of Hydroclear PVC material unless you request otherwise; for instance Medicryl with Mediflex canal. It can be made entirely with hypoallergenic materials and is very popular for geriatric applications. When Hard Clear is paired with PVC, it can be made in clear, opaque flesh tone, or tinted pink, brown, orange, yellow, blue, or purple. Hydroclear A hypoallergenic polyvinyl chloride compound with a Shör A hardness rating of 50, with great flexibility. Available in a nearly invisible clear, or in your choice of a bright neon tint in orange, lemon yellow, blue, or hot pink. It’s an excellent choice for children! Protint A popular material with a Shör A hardness rating of 55, its formulation is identical to Hydroclear, but with a subtle pink tint. 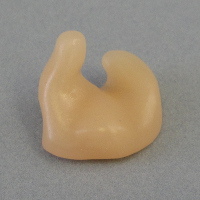 Dermatex This opaque, flesh coloured material has a Shör A hardness rating of 45. It’s one of the most flexible compounds on the market, making it excellent for severe losses and cases where the fit may be difficult. 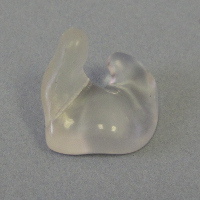 Silicone This medical grade material is highly inert. It is widely used in profound losses, with a Shör A hardness rating of 45. 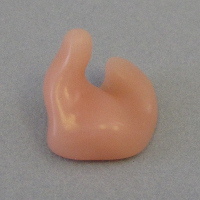 It is only available in opaque flesh colour, with either a satin or a shiny finish. 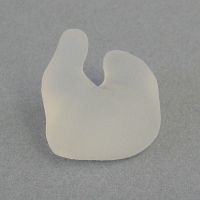 Silicone II Exceptional for fitting profound losses, this is the softest material presently available for manufacturing earmolds and swim or noise plugs, with a Shör A hardness rating of 25. It exhibits all the hypoallergenic and sealing features of our conventional Silicone, but is available in any colour or swirls of colours that you desire, including a clear-as-glass shiny finish, tinting and solid colouring of both natural and neon colours, sparkles, and more! Catamaran Similar in performance to Silicone II, with excellent sealing characteristics, this material is used exclusively in the manufacture of swim plugs and solid noise attenuators. 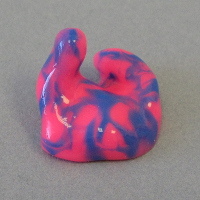 Available in any solid colours or swirled colours, plugs made from this material float on water! 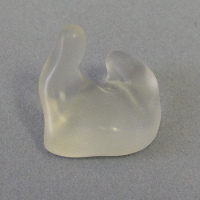 Due to the nature of the material, neither clear plugs nor sparkles are possible.